Injustice any where is a threat to justice everywhere Some people think the indigenous people of Biafra (IPOB) are just here for the restoration of Biafra, they want IPOB to remain calm over every evil plot that is going on in Nigeria the truth is that anyone who sees evil and keep quiet, that person is also evil and will share from that evil act. When Boko Haram abducted Dapchi girls in Yobe state, orchestrated by Jubril impersonating late Mohammadu Buhari they brought back all the girls with the exception of one who happens to be a Christian, What happened? IPOB rose up in a clamorous demonstration demanding the release of the girl from jubril Buhari and his bloody political thugs Boko Haram and why did IPOB do so? because justice has no boundary. 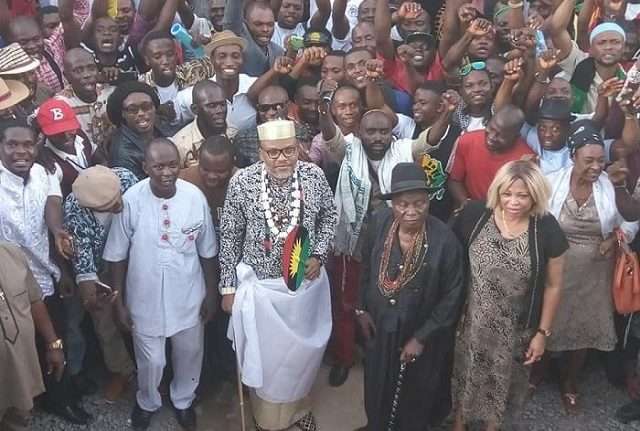 IPOB is on it again, our leader has directed the legal team to sue them for fake result allegedly issued by waec to the imposter in also rock, a Sudanese who is currently disguising himself as Buhari When Buhari wanted to contest in 2015, he was unable to present his west Africa examination council result (waec) today he will say the military is with it, tomorrow the schools are with it some time ago a lawyer took the battle upon himself, he filed a case in the federal high court Abuja claiming Buhari never sat for the exam which is the raw and bitter truth because judging with facts, WAEC was established in 1952 And Buhari claimed he was born in 1942 if you subtract 1952 from 1942 You have 10 does it mean he sat for the exam at the age of 10? How did he do the magic? The lawyer later had to withdraw the case because his life was threatened by Buhari and his security agents. But this time around we are not relenting because we now have a double case against the Fulani political cabals. (1) Is that the man in Aso rock is not Buhari but a Sudanese Called Amino Jibril who was imported to complete the late Buhari's tenure Buhari died in January 2017 as was rightfully claimed my Nnamdi Kanu the evidence abound but if they think our claim is false, he should be subjected to a DNA test in other to ascertain the raw truth. (2) The waec result presented by Jibril Buhari is fake as he never set for the exam If we are to judge by his fake result, I understand that he was just 10yrs when he falsely set for the exam which is not possible how come the photograph attached on the result is an old man's picture I also understand that in those days, there was no picture attached to any waec result. The Fulani's have made that mistake of importing a Sudanese to represent Buhari and forging a certificate for him But they can only do one thing for them to avoid this monument disgrace that is about to befall them they should only come out to confess their evil acts or they wait to be exposed by the great indigenous people of Biafra IPOB. Many people will ask, what is IPOB's concern since they say they're not Nigerians and also want Nigeria to disintegrate We are concerned because we hate abomination the war we are fighting against injustice has no limit and it knows not any boundary, I also remember vividly back then in 2015 when Nnamdi Kanu was publicly and vigorously lambasting the Ghanian president John Mahama for his incompetence that will tell you that we IPOB are not fighting only for Biafra restoration or only fighting for crime in Biafra land but we are fighting evil everywhere we see it in the world.